All flavors are dark chocolate unless otherwise noted, and most are plant-based. Questions? 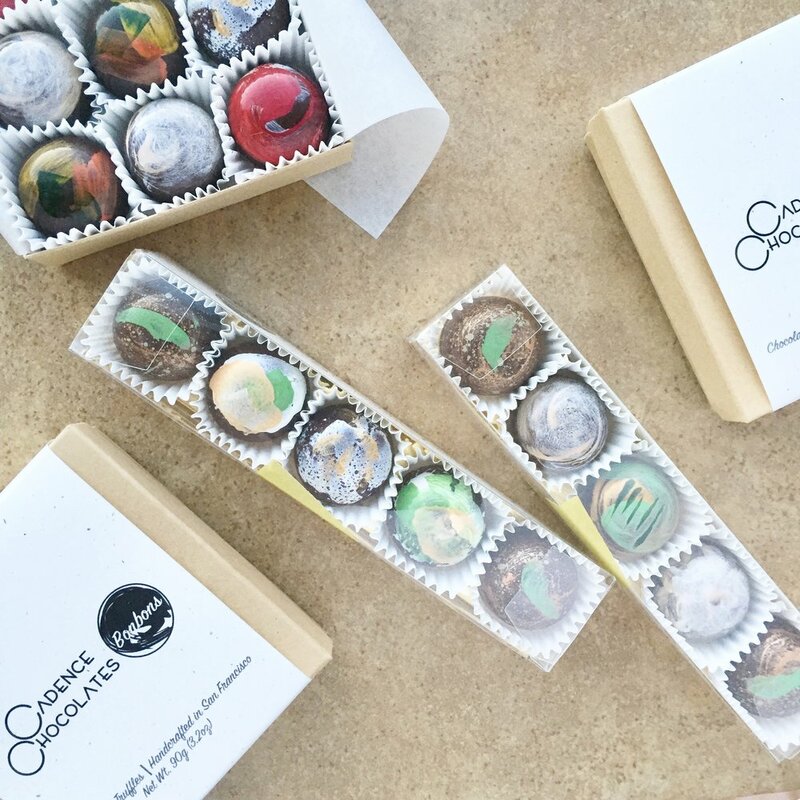 Say hello at hello@cadencechocolates.com - we'd love to hear from you. Freshly foraged lavender and a drop of eucalyptus roundsout this gentle floral chocolate. Vegan. Fresh thyme and 55% coconut milk chocolate from Marou cradle a whole roasted hazelnut. Herbaceous, nutty, and softly sweet. Vegan. Strawberry pate de fruit and a strawberry dark chocolate ganache layer in the red fruit flavor. Vegan. Straight to the point, these bonbons are simply dark chocolate, organic sunflower seed butter, and salt. A refined and grownup answer to peanut butter cups. Vegan. Scotch mallows are not new. Our take: vegan marshmallows enveloped in whiskey dark chocolate ganache. Familiar, refined, and deeply satisfying. Bulk orders without packaging are available to complete the dessert spread at your event. We love context. The who/where/when/what/why in your message helps us get started. We work with chocolate from Guittard Chocolate Company, which sources fairly traded beans from family farms implementing sustainable practices. We incorporate organic ingredients (peanut butter, rosemary, and black sesame tahini, to name a few) into our ganaches and as of Earth Day 2016, we are making the switch to organic dairy. Our goal is to be transparent and increase the use of organic ingredients and sustainable practices as we grow. While we take great care to avoid cross-contamination, we produce in a shared kitchen where chefs use eggs, dairy, soy, wheat, tree nuts, and peanuts, and our suppliers deliver a wide variety of ingredients throughout their day. If eating out is something approached with extreme caution or avoided entirely, these chocolates may not be for you. That said, we love making chocolates that accommodate most dietary preferences. We put heart and soul into our primarily vegan flavors and happily provide ingredient information. Most flavors contain coconut, and our tahini and sunflower seed butter chocolates are delightful when trying to avoid tree nuts altogether.